Place clean chicken in a large resealable bag and set aside. Mix balsamic vinegar, honey, oil, mustard and salt and pepper in a small bowl. Whisk until emulsified. Reserve 1/3 cup of the glaze for later basting and pour the remainder over the chicken in the bag. Seal the bag and manipulate the bag to coat the chicken thoroughly. Let marinade 4 to 6 hours, or overnight (24 hours max). Remove chicken from the bag and place it on a large cutting board for preparing to stuff. 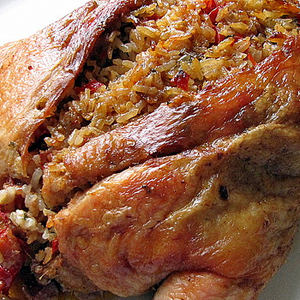 With heavy duty kitchen scissors, cut open the top of the chicken, creating a sizable cavity for stuffing. Take the prepared stuffing mixture and stuff the chicken and place in a large roasting pan. Drizzle a portion of the marinade from the bag over the bottom of the pan. Roast 40 min, and then baste chicken and rice with the reserved glaze (reserved from above). Important: Do not use the marinade from the chicken for basting. Repeat basting every 5 to 7 minutes until chicken is 165 degrees on an instant read thermometer and juices run clear (about 1 hour total cooking time). When the chicken is done, place on a serving platter and serve. Enjoy with your favorite vegetable or salad.